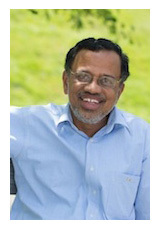 Gopalan Srinivasan joined the Faculty of Business Administration in 1987 and was a member of the Finance Area. He taught Principles of Finance in the BBA program and Financial Management and International Financial Management in the MBA program. He was honored as a University Research Professor in 2003, having demonstrated a consistently high level of scholarship deemed to be of international stature. In 1996 and 2006 he received a UNB Merit Award, and in 1999 and 2007 he received the Faculty of Business Administration's Excellence in Research Award for performance across his career. Additionally, he received the Faculty's Excellence in Teaching Award in 2001, and the UNBF MBA Society's Professor Recognition Award in 1999. Prior to joining the Faculty, ‘Srini' was an Associate Professor and Area Chairman of Finance at the Indian Institute of Management, Ahmedabad, India. He has taught doctoral, graduate, and undergraduate courses in finance and accounting at Indian and Canadian universities. He also has taught in executive programs of universities in India and the Maastricht School of Management, the Netherlands. He holds a Certified General Accountants designation in Canada. Dr. Srinivasan was an Area Editor for the International Journal of Production in Quantitative Methods and was a member of the Editorial Review Board for Decision Sciences. His research has included supply chain management/inventory theory, working capital management, accounting policies, corporate finance, investments, international business and human development index. He has over 100 journal articles and refereed proceedings. His findings have appeared in journals such as: Decision Sciences, the European Journal of Operational Research, IIE Transactions, the Journal of Business Finance and Accounting, Management Science, OMEGA, Sankhya, and Social Indicators Research. Dr. Srinivasan served as the president of the Association of Indo Canadians. He has served as the Treasurer of AUNBT and as trustee of the Defence Fund of the Canadian Association of University Teachers. He served as s a member of the board of trustees of the Academic Employees Pension Board at UNB for over a decade. Cash Holdings and Firm Value during Turbulent Times: Canadian Evidence, in Proceedings of the Fifth Annual Conference on Accounting and Finance, Singapore, June 2015. pp. 1-4. (With Q.Mei). Winner of the best research paper award. Inventory Replenishment for Profit Maximization over a Finite Horizon, in International Journal of Operations and Quantitative Management, Vol. 21(2), 2015, pp.127-139 (with F. Arcelus and Pakkala). New Brunswick Model of Shared Risk Pension Plan: Human Resource Implications in an Academic Setting, in (2013) Proceedings of the Atlantic School of Business Conference, Antigonish, Nova Scotia. Recipient of research grants from NSERC and SSHRC for a number of years. University of New Brunswick.